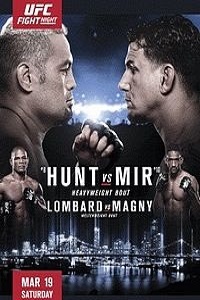 UFC Fight Night 85: Hunt vs. Mir (formerly UFC Fight Night 84: Hunt vs. Mir) took place on March 20, 2016 at Brisbane Entertainment Centre in Brisbane, Australia. Due to time differences, it aired on March 19, 2016. Click the stars to rate how good you think UFC Fight Night 85 was.